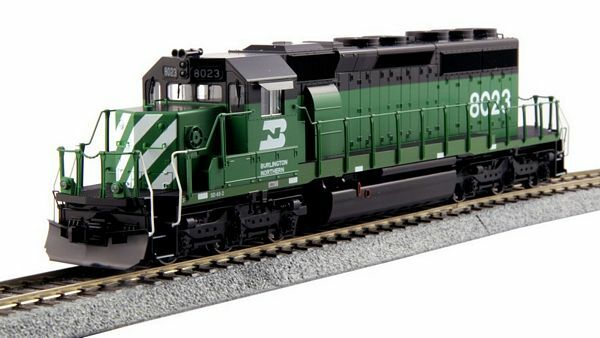 This is theEMD SD40-2 Mid Production Burlington Northern #8023diesel locomotive from Kato. One of the best-selling EMD locos ever built, over 3,000 SD40-2s were sold in the US and Canada. During production, some prototype features were changed. These ready-to-run models are based on mid-production units. Like the prototype, these locos incorporate functioning ditch lights which can be switched between alternating (flashing) and steady lighting modes in DC (for DCC operation, ditch lights can be synchronized with horn or bell functions by installing an 8-pin sound decoder, sold separately). The models also come with all details and handrails installed, golden white LED headlights and illuminated, printed number boards. They feature DCC-friendly construction with a 1.1" 28mm speaker housing in the fuel tank. As a prototype, the SD40-2 was the most popular second-generation diesel with sales of over 3000 in the U.S. and more than 700 in Canada. There were many variations of this popular diesel because of the long production run – “Mid” versions had large anti-climbers (the front porch area of the locomotive) and deck mounted ditch lights necessary for meeting modern FRA standards . The BN amassed a fleet of 827 SD40-2's between 1972 and 1980, starting out hauling coal trains out of Wyoming's Powder River Basin and then started moving transcontinental freight between the West Coast and the Midwest.